When space permits, select a reel with greater hose capacity than you require. 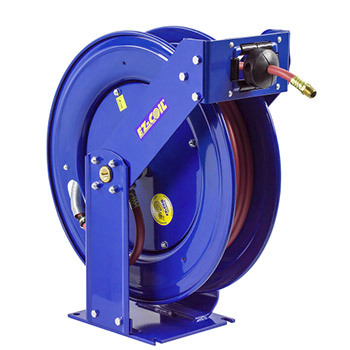 This allows you to rewind the hose with less care and keeps the hose well protected within the disc dimension, even if the hose is not wound in uniform coils. The drawing below two reels with different shapes and dimensions but with identical hose capacity. In most cases, more than one reel will handle the size and length of hose you need, so you can specify a reel to fit your space requirements. In selecting your reel please note the size of you hose versus the inlet and outlet sizes. Reducing your fitting & hose size will allow for more hose capacity. Choose from Spring Driven, Hand Crank or Motor Driven retraction. Automatic rewind requiring no power source. Operator is to guide the hose or cord as it self-retracts and wraps around the drum. 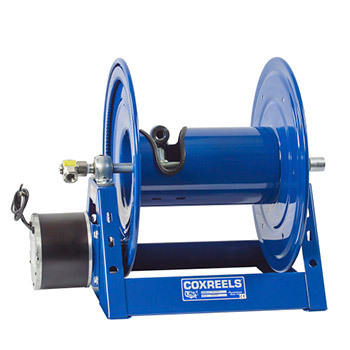 Controlled Self-retracting spring driven reels for increased safety. Reduce retraction speed by up to 80%. Control hose or cord whip hazard. Requires no external power source. Keep your workplace organized. 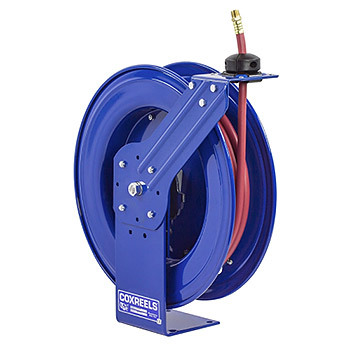 Utilize space and maximize efficiency Improve hose, cord & cable management! 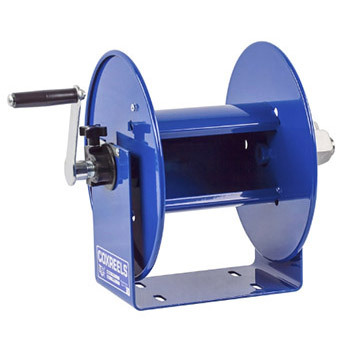 Operator must manually crank the reel and guide the hose or cord evenly as it wraps around the drum to reach full capacity. Requires a power source to operate in AC, DC, Air or Hydraulic power. On/Off switches and speed controllers are available to help control retraction speed. You must guide the hose or cord efficiently back on the reel to reach full capacity. Determine which mountin position you require. All reels are shipped in the floor-ceiling mount (FM) position with the exception of the "T," "EN," and "SD" Series, which are shipped in the wall-truck mount (WM) position. See diagram to the right for the "SP & DP" Series as well. Consider temperature, product type and pressure required (PSI). 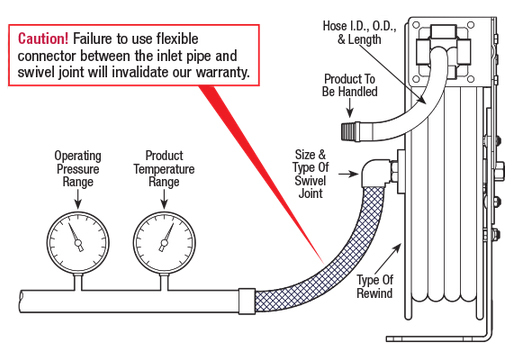 Always use good quality hose rated for the service and operating pressure required. Poor quality hose tends to expand and contract under pressure surges. When this happens, hose remaining on the reel may bind and become difficult to handle. In extreme cases, poor quality hose may expand under pressure to the extent that the reel becomes distorted and inoperable.